Welcome to another gift idea. 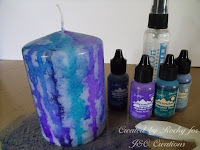 This is a very easy way to decorate a candle using Alcohol Inks. I bought an inexpensive candle from a local discount shop and set about colouring it. I have used the colours that I had on my desk after making the brooch but I think they look OK, you could use colours to match your decor or someones favourite colours. You will need two or three inks, some Stazon cleaner in a pump spray and a felt applicator. Drop the ink on the top of the candle and let it drip down the sides, move round the candle dripping colour where you want it. To achieve the mottled effect and make the colour run a bit more you can spray it with the Stazon cleaner. DO NOT SPRAY BLENDING SOLUTION, it is flammable and harmful if inhaled, that is why we use Stazon. Another word of caution is if you spray too much your colour will all run off.....the voice of experience speaking! Using Stazon also slows down the drying process so you'll need to set it aside overnight, don't be tempted to use a heat gun, it will melt. I have also used the felt tool to dab more colour on once the spray is dry, I like the blotchy effect. 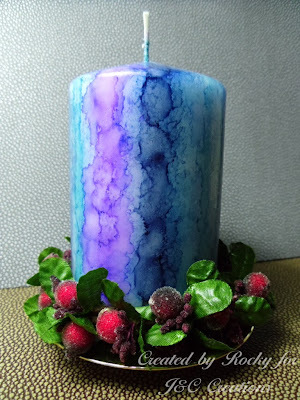 To decorate further you could scratch a design into the candle, the colour is only on the surface and will scratch off with a craft knife. The candle is safe to burn, the alcohol evaporates quickly when decorating so by the time it is gifted all traces are gone.